This edition focuses on the GNU version of make, which has deservedly become the industry standard. 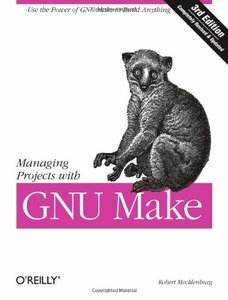 GNU make contains powerful extensions that are explored in this book. It is also popular because it is free software and provides a version for almost every platform, including a version for Microsoft Windows as part of the free Cygwin project. Managing Projects with GNU make, 3rd Edition provides guidelines on meeting the needs of large, modern projects. Also added are a number of interesting advanced topics such as portability, parallelism, and use with Java. Robert Mecklenburg began using Unix as a student in 1977 and has been programming professionally for 23 years. His make experience started in 1982 at NASA with Unix version 7. Robert received his Ph.D. in Computer Science from the University of Utah in 1991. Since then, he has worked in many fields ranging from mechanical CAD to bioinformatics, and he brings his extensive experience in C++, Java, and Lisp to bear on the problems of project management with make.